Over the past few days we have received many requests from Jo-Ann shoppers asking if we had instructions for making the colorful chain-link purse or clutch referenced in a recent Jo-Ann sales flyer. 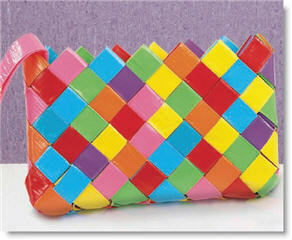 This clutch, made with Duck® brand duct tape, is mentioned in Jo-Ann’s July 11, 2010 edition under the Just Ask Jo-Ann Ideas section and is pictured on the left. I verified that this article pointed readers to a link at Joann.com/jul10 that, as many of our readers noted, is not functioning properly. Since we had so many requests for instructions to make this duct tape chain-link purse, I did some research and ended up contacting Joann.com’s Customer Service Department on Thursday (7/15). This afternoon I received a helpful reply from Frances who also sent me the following instructions for making Joann.com’s duct tape chain-link clutch (click link to view and print or download this 1.37 MB 2-page PDF file below). I hope you enjoy these free directions to making your own duct tape clutch from Jo-Ann. Feel free to share this page with your friends and offer your own tips in our comments section below. I appreciate Joann.com making this file available to me. I could not get the instructions for makeing hair pins sparkle with style on the internet. I would like to make these hair pins. I also could not get the instructions for the hair pins. Geneva and J.L. Hernandez — You can view all the July 2010 Flyer Projects here. I’m not sure which specific hair pins you were looking for but there are several hair crafts on the Joann.com page referred to above. Also on the Joann.com page, in the left column, are links to Jo-Ann’s other monthly flyer projects so you can check them out also. I hope this helps. Thank you for visiting the Shopping-Bargains Blog! Several readers have also asked us about instructions for the computer briefcase or laptop bag from Joann.com. You can download the Jo-Ann Laptop Bag instructions here. Please note that on the page referenced in the link above is a photo of the laptop bag — below that photo is a link to download the project as a pdf file or you can download it here. I can’t find anywhere to get instructions on this chain-link purse and now the page doesn’t even exist. You’ll be happy to know I’m never using his site again.